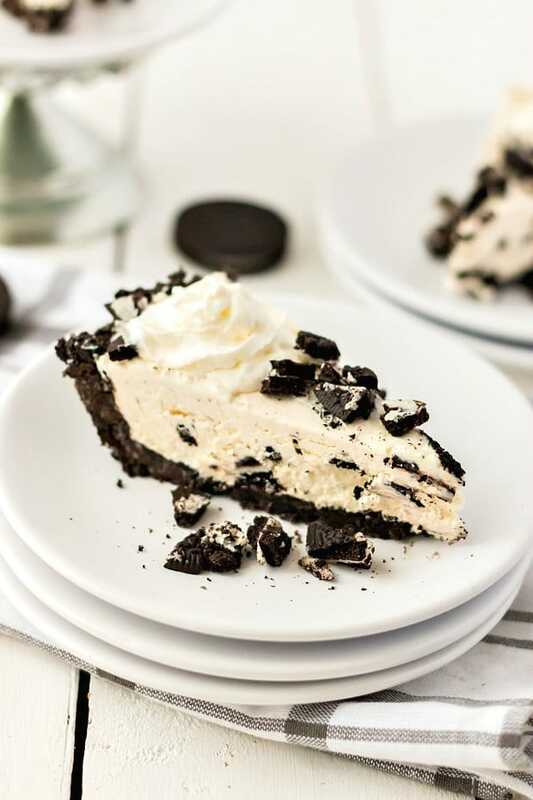 This Oreo cream pie is everyone’s dream: creamy and packed with Oreos, and as a bonus, it’s super easy to make. 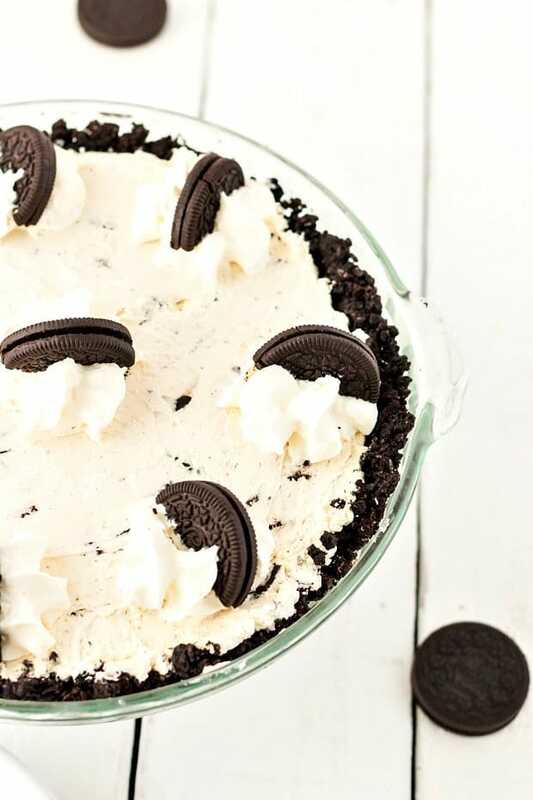 Our Oreo cream pie recipe only calls for five ingredients and requires no baking! It doesn’t get easier than that. I can throw this entire dessert together in under a half hour. For more fantastic no-bake pie recipes, try our jello pie, peanut butter pie or chocolate pudding pie. There is just something about Oreos that I can’t resist. I’m a fan of anything Oreo flavored. I love cookies n cream everything and I have to refrain from actually buying Oreos, for risk of eating the entire package myself. Can anyone else relate?! Pie is like my dream dessert. 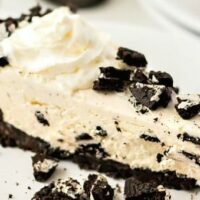 (Custard pie is one of my favorites) This pie is creamy and Oreo flavored, but the whipped topping and cream cheese mixture used for the filling keeps it light and saves it from becoming overly rich. In fact, the filling is the best part of the whole pie. I usually don’t have leftovers of this dessert. No matter where I bring it or if I’m just making it for our own home, it tends to be gone pretty quickly. But, the few times I have had leftovers, it tastes just as good the next day! To make the crust for the Oreo pie, crush the Oreo cookies in a food processor, or you can place them in a Ziploc bag and bash them with a rolling pin. You will be using both the filling as well as the wafers, so you can crush the entire cookie together. Next, mix the crushed Oreo cookies with the melted butter. Then, press the mixture into the bottom and up the sides of a 9-inch pie plate. It helps to use the bottom of a glass cup for this. Finally, place the crust in the fridge to give it time to set while you make the filling. 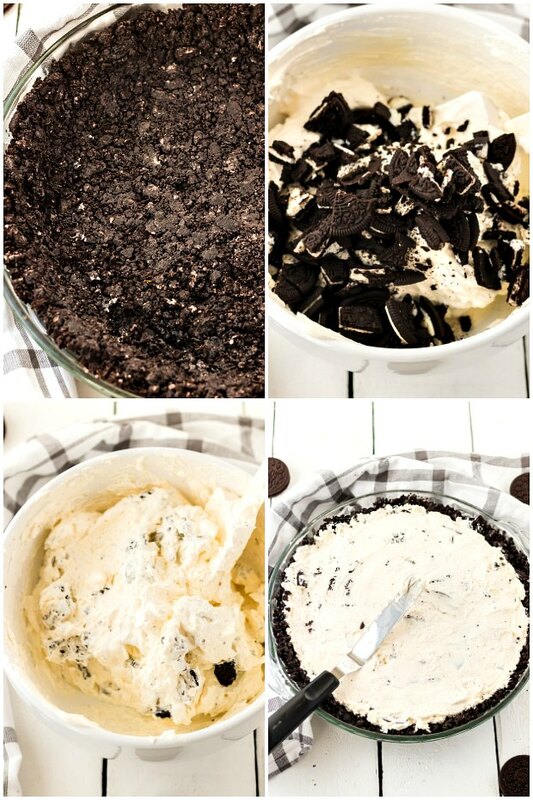 Note: if you want to save yourself time, you can also purchase a pre-made Oreo pie crust from the store! For the filling, in a large bowl, beat together the cream cheese and powdered sugar until soft. Next, fold in the whipped topping, followed by the chopped Oreo cookies. I like to leave some of the Oreo pieces a bit bigger, but also include the tiny crumbs!. Remove the pie crust from the fridge and spoon the filling into the pie crust. Then, smooth the top. Finally, place the entire pie in the fridge to chill for at least an hour before serving. When serving my Oreo cream pie, I like to add a little bit of extra whipped topping to each piece and then garnish it with an Oreo that’s been cut in half. It not only looks really great, but it’s the perfect extra topping for each piece of the pie. If you are a chocolate lover, you can also consider drizzling a small amount of chocolate sauce over the top of each piece. Keep it light as to not overpower the pie, but it adds a nice garnish and makes it look even prettier. You should always store your Oreo cream pie in the refrigerator. The cream cheese and whipped topping base of the filling need to be refrigerated to hold. If you are using a premade pie crust, they usually come with a plastic lid you can put over top. Just pop that on and put it in the fridge! If not, you can use plastic wrap to cover your pie and put it in the fridge. This Oreo cream pie is one of my all-time favorite sweet treats, as anything with Oreos tends to be. I can’t wait to see if it becomes one of your favorites, too. These cool, creamy, easy and delicious homemade no-bake dessert is a favorite! Crush the Oreo cookies in a food processor. Or place them in a Ziploc bag and bash with a rolling pin. Mix the crushed cookies with melted butter. Press into the bottom and up the sides of a 9-inch pie plate. I like to use the bottom of a glass cup for this. Place in the fridge as you make the filling. In a large bowl beat the cream cheese and powdered sugar together until soft. Fold in the whipped topping, followed by the chopped Oreo cookies. Spoon the filling into the pie crust then smooth the top. Place in the fridge to chill for at least an hour before serving. This is one of our absolute favorite desserts! Oh yum! I had to pin this to my Pie Recipe Pinterest board for the next time we have a family party. My kids will absolutely love it! 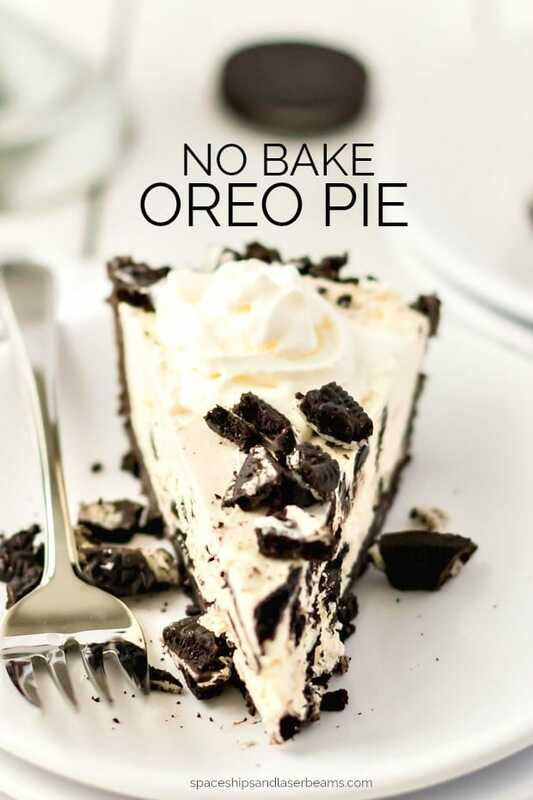 Anything Oreo is a win, but no bake? A complete must for our entertaining! Thanks for sharing.